Ramen noodles and chocolate? Tortilla, salt, and lime chocolate? 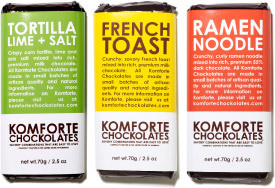 Komforte chocolates pairs sweet & savory in these specialty bars. While I can appreciate salted caramels, I’m supremely unconvinced that Ramen & chocolate is anything other than a mistake. French toast with chocolate might not be a bad thing. But tortilla, chile, and lime with chocolate? It’s stoner food.